Got what it takes to be a racing President? Stuck in a dead-end job with no future? Tired of being passed over for the head job? Did you apply to be a racing sausage but were told you just didn’t "meat" the requirements? Well, maybe you can just skip all that and go straight to running for President. 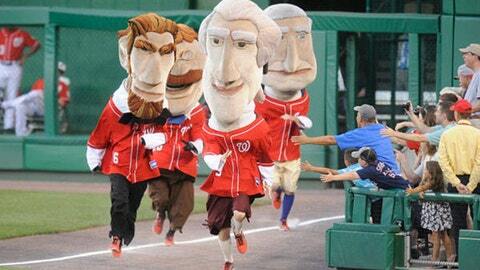 The Washington Nationals are looking for a few good men, or women, to join their racing President mascots and entertain the fans with their mid-game races. No sweat, right? Well, hold on there. Not just anyone can put on a giant head and run around. First of all, do you have a high school education? Remember, you’re applying to be a President, not a polish sausage. Are you between 5-foot-7 and 6-6? This is not a job for Muggsy Bogues or Yao Ming. If we tell you that you’re now Teddy Roosevelt, are you prepared to BE TEDDY ROOSEVELT? To walk like he did, to speak softly and carry a big stick? To resurrect the Bull Moose Party? If the answer is yes, maybe you should aspire to be more than a mascot. But if this is your calling, apply here. And remember the words of that Rough Rider: "Far and away the best prize that life has to offer is the chance to work hard at work worth doing."